Those with sharp memories might recall failed bids to bring an MLS team to St. Louis in 2008, 2009, and 2017. The most recent involved a failed stadium funding bill, whose narrow failure seemed to spell the end of the region’s MLS hopes. However, on October 9th of last year, a group consisting of the Taylor and Kavanaugh families broke ground on St. Louis’ 4th bid for an MLS team. The group is calling their bid MLS4TheLou, both a reference to the city’s nickname and the local soccer supporters, the St. Louligans. Lead by Carolyn Kindle Betz, Andy Taylor’s niece, the group would be the first majority female-owned team in MLS history. The group launched their MLS4TheLou scarves and hats, with the proceeds going to Taylor Family Foundation. Nearly immediately demand for MLS4TheLou scarves and hats outpaced the supply with a total of $50,000 going toward charities. Founded in 1996, MLS is made up of 24 teams with expansion franchises Nashville SC, Inter Miami CF, and Austin FC joining the league in 2020 and 2021. MLS commissioner, Don Garber, has previously said that the league will cap expansion at 28 teams. St. Louis is bidding for that coveted final spot. The main competition for the spot is a bid lead by the Sacramento Republic, a United Soccer League Club (USL) based out of, well, Sacramento. The Republic are also rivals of Saint Louis FC, the St. Louis team that is tied to the MLS4TheLou bid through their owner, Jim Kavanaugh. Both Sacramento and St. Louis check those boxes, Sacramento averages over ten thousand fans per match, over double what Saint Louis FC averages, they also have ready-to-break ground stadium plan, and recently added billionaire Ron Burkle (owner of the NHL’s Pittsburgh Penguins) to their ownership group. Despite all of what Sacramento brings to the table, MLS4TheLou remain optimistic, citing their majority female ownership as a first within MLS, along with a strong soccer history in St. Louis, and a privately funded stadium plan. 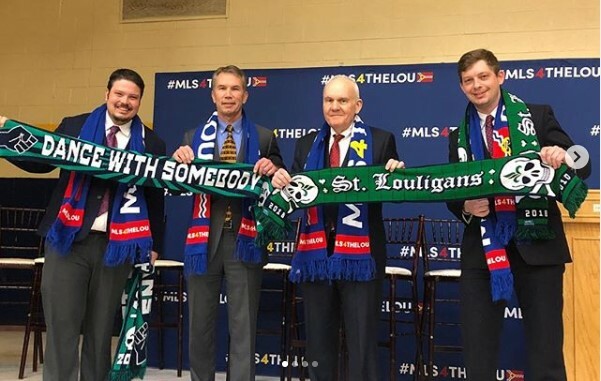 In mid-March, Commissioner Garber showed up to St. Louis on a surprise meeting to call on local corporate leaders to pledge their support for the MLS4TheLou bid. Most importantly the bid is lacking a stadium sponsor and kit (jersey) sponsorship. Normally these are agreed upon until well after a franchise is awarded, but MLS tends to move the goalposts depending on the current expansion climate. Since March there has been little to no information coming out of either Sacramento or St. Louis. There have been hints that the coveted stadium renderings would be released soon, but the group is “waiting for the right time”, according to Tom Strunk, Saint Louis FC and WorldWide Technology CFO. The wait won’t last forever as the MLS is set to convene their annual Board of Governors meeting on April 17th in California, where, amongst other things, expansion will be discussed. Neither the Sacramento nor Saint Louis bids have been invited to present their proposals, so it is likely that no final vote will come from this BOG meeting, but there is a chance the invitations will come of short notice. Update: Sacramento has now been invited to present their proposal at this meeting. As of now, there is little for soccer fans in St. Louis to do but wait and support soccer in whatever fashion they can, either through the professional and local Saint Louis FC, playing in rec leagues, or watching it on TV. Stuart is an Ops Specialist in our Technology and Managed Print department. He's a South City resident who at a young age caught a love for the beautiful game (soccer, if you're wondering). He is a supporter of Saint Louis FC, Fulham FC, and the US National team and has traveled around the world following them. Send Stuart an email. Office Essentials is business products and services with offices in St. Louis, Columbia, Springfield, Rolla, St. Joseph and Kansas City, MO, as well as Springfield and Bloomington, IL. This is our blog. We share company news, office products industry news, and ways we can use our expertise to help your company save time, costs, and carbon. We call it making the SmartChoice.